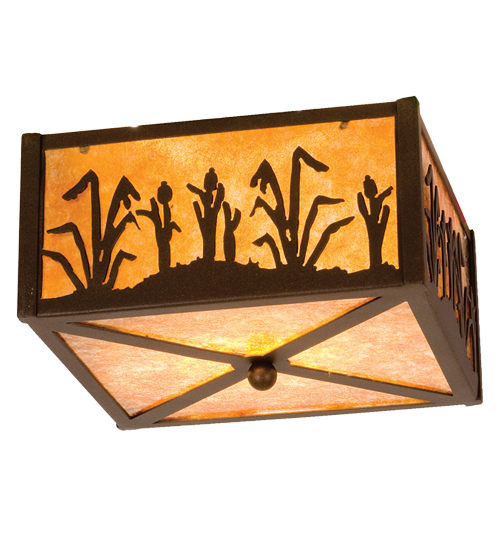 Description: Cattails and marsh grasses accent this nature inspired this flushmount. The fixture is finished in Cafe Noir and has Amber mica panels. Handcrafted in our 180,000 square foot manufacturing facility in Yorkville, New York at the foothills of the glorious Adirondack Mountains. Custom choices include various designs, finishes, and sizes. Dimmable energy efficient lamping options offered. UL and cUL listed.